Time and Talents Pub Club is back into full swing after the Christmas break. We met last week at Surrey Docks and the Ship in Rotherhithe (Tuesday) and the Angel in Bermondsey ( Thursday). 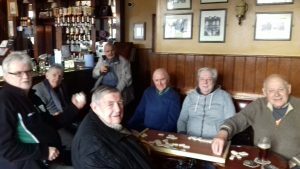 We’ve already had loads of quizzes, advice, subjects for discussion and dominoes but friendship and plenty of chatting is freely available for any older men in the area. We’re hoping to set up a further Club around the Blue in the near future. Keep watching for further updates – and meanwhile, come along if you fancy a pint (or a lemonade) with friends. If you fancy coming along, and want to know more, contact Jeff on 020 7232 5666 or by email.